Yet another recon report came in with winds in the lower cat 1 range. Realistically this is a cat 1 huricane now with about 75- 80 mph winds with stronger gusts. NHC will likely drop winds a little lower again. A band of heavy rain is situated from just south of Virginia Beach, across eastern North Carolina to just south of Myrtle Beach. Doppler rainfall totals of 3-5" have occured near the North Carolina coast in areas where heavier rainbands have been located. Recon aircraft reports winds still only minimal hurricane strength of about 80 mph. I have dropped my estimate to 90 mph as NHC has kept their estimate at 100 mph. IMO they are doing this not to be "caught with their pants down" in case there is some strengthening before landfall. Both of our estimates are still probably high. In reality 80 mph with gusts to 95 or 100 is probably more representative. NOAA sea analysis show highest seas around 43 feet near the low center offshore of South Carolina. 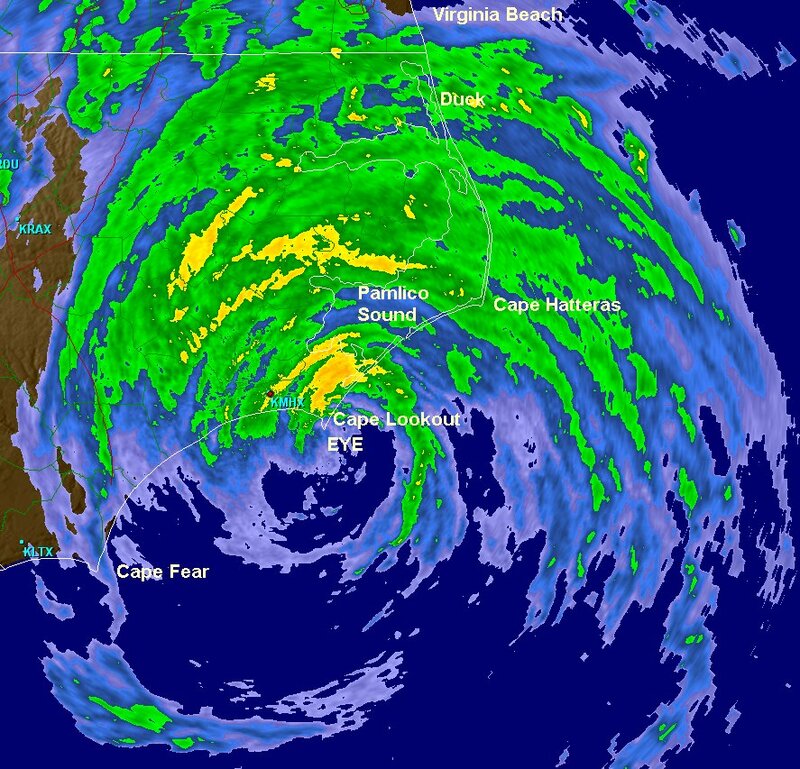 As of 10 pm edt / ast Irene was centered near 32.4 N / 76.9 W or 210 miles ssw of Cape Hatteras, North Carolina. It is moving nne at 14 mph. Top sustained winds are estimated at 90 mph (NHC 100 mph last advisory). Pressure is estimated at 950 mb. The recon recently measured surface winds of minimal hurricane forece - about 75 mph. Buoys from Cape Lookout in the eyewall are now reporting winds of 60 mph sustained with gusts to 78 mph. Nearby Beaufort, NC is reporting winds of 31 mph gusting to 56 mph. It appears that the official estimate is well overrated. For a 90 mph hurricane we should be seeing gusts to 105-110 mph. Nothing close is being reported by the recon, surface weather stations or buoys. 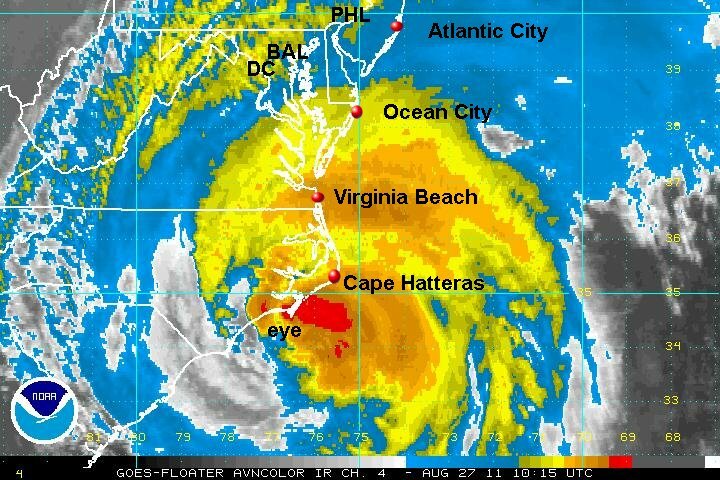 Irene may not even be a hurricane. With a 75 mph hurricane, gusts still should be in the 90 mph range. My wind estmate will continue to be lower than the hurricane center's. This is great news for the east coast as Irene has not seen the potential strength with the low pressure that is being reported. As of 7 am edt / ast Irene was centered near 34.1 N / 76.5 W or about 15 miles south of Cape Lookout / 70 miles sw of Cape Hatteras, North Carolina. It is moving nne at 14 mph. Top sustained winds are estimated at 75 mph / gusts to 90 mph (NHC 90 mph last advisory). Pressure is estimated at 952 mb. 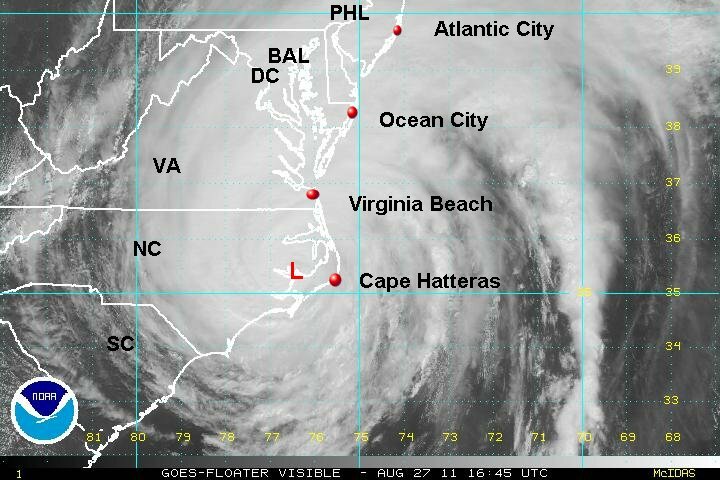 Forecasts take Irene over Pamlico sound today and back offshore to near Virginia Beach late Saturday afternoon to early evening. Sunday morning Irene will be east of Atlantic City, NJ. and move inland over Long Island sunday morning to possibly midday......continuing inland into New England Sunday. Interests in Nova Scotia, Canada, and U.S. coastal states, Notrh Carolina to New England should follow this tropical cyclone closely. This will not only be a coastal event! The big cities of the Northeast, Washington, D.C., Baltimore, Philadelphia, New York city, and Boston will likely see very heavy rainfall and strong winds. Flooding is also likely. This is an unusual event, so don't take this situation lightly! It appears the Irene is a minimal hurricane, possibly a strong tropical storm. The winds that are being found are almost unheard of with a pressure of nearly 950 mb. Wind reports bear out that maximum sustained winds of near 50 mph with gusts in the 70-80 mph range. Again with a minimal 75 mph hurricane we should see gusts in the 90-95 mph range. Doppler radar shows heavy rain from eastern North Carolina to the Tidewater of Virginia to the coast of Maryland. Rainfall estimates are 6-8 inches from south of Albemarle sound to the coast south of New Bern. New Bern, NC had a report of over 7 inches recently. Wind reports recently show New Bern with sustained winds of 46 mph, gusting to 74 mph. Other reports: Greenville, NC - gust to 48 mph / Norfolk, VA - 28 mph, gusting to 39 mph / Hatteras, NC - 52 mph, gusting to 76 mph / Manteo, NC - 35 mph, gusting to 52 mph / Currituck, NC - 26 mph, gusting to 41 mph. The highest gusts seen so far have been 79 mph at Hatteras, NC at 5:36 am & 78 mph at Cape Lookout around 4 am. 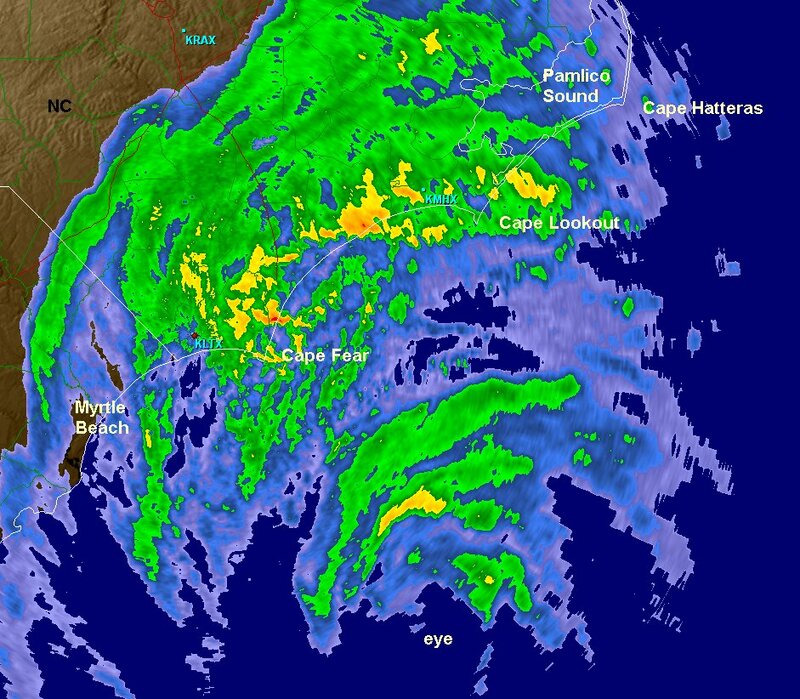 As of 10 am edt / ast Irene was centered near 35.0 N / 76.5 W or near the southwestern end of Pamlico Sound, North Carolina. It is moving nne at 14 mph. Top sustained winds are estimated at 75 mph / gusts to 85 mph (NHC 85 mph last advisory). Pressure is estimated at 952 mb. 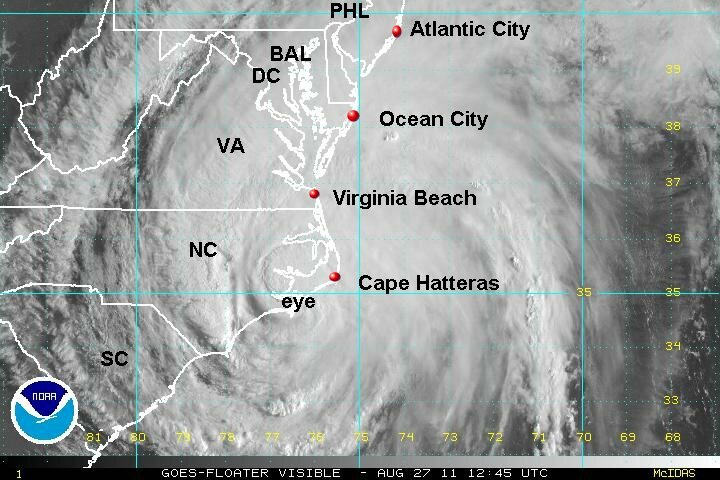 Forecasts take Irene over Pamlico sound today and back offshore to near Virginia Beach late this afternoon to early evening. Sunday morning Irene will be east of Atlantic City, NJ. and move inland over Long Island Sunday morning to possibly midday......continuing inland into New England Sunday. Interests in Nova Scotia, Canada, and U.S. coastal states, North Carolina to New England should follow this tropical cyclone closely. Most people don't realize the power of a tropical cyclone. In reality Irene is probably a strong tropical storm. Maximum winds have been in the 60 mph range with gusts to 70-80 mph. Damage starts to occur at about 50 mph, less than that if the winds are sustained for a while. There have numerous reports of water being pushed up the rivers and sounds bringing inland flooding. Power outages with fallen power lines and trees are also common. 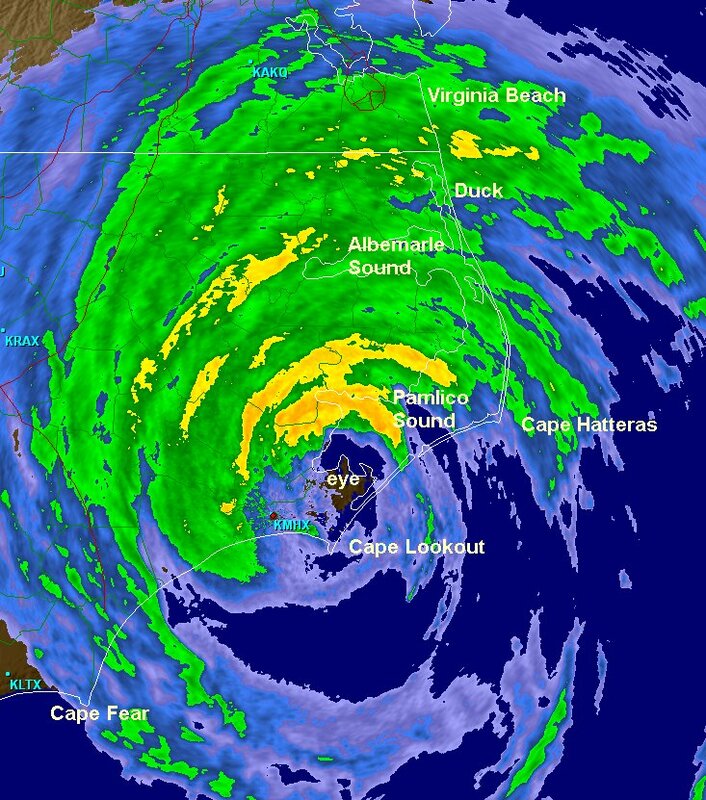 If Irene came in as the advertised 90 mph or stronger damage would have been far worse. 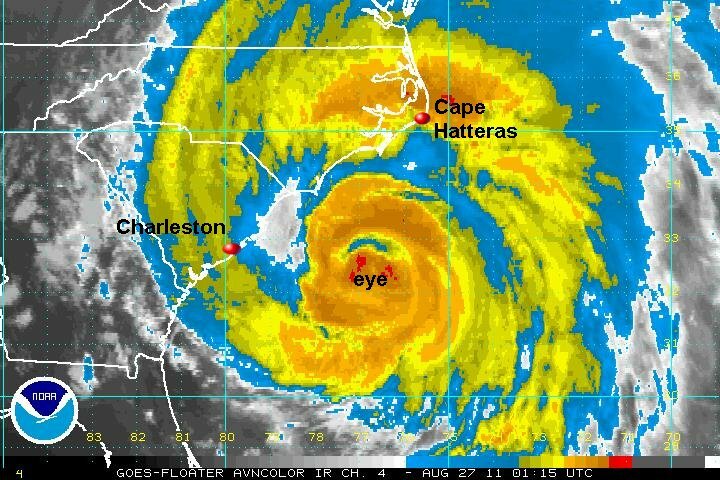 It appears that Irene has lost no strength over eastern NC. Doppler radar has estimated a large area of rainfall 3"+ from eastern Delaware to all of eastern North Carolina. Totals near 10" are estimated west of Norfolk and near Pamlico sound where a bulls eye of nearly 15" has been estimated. The highest gusts seen so far have been 79 mph at Hatteras, NC at 5:36 am & 78 mph at Cape Lookout around 4 am. 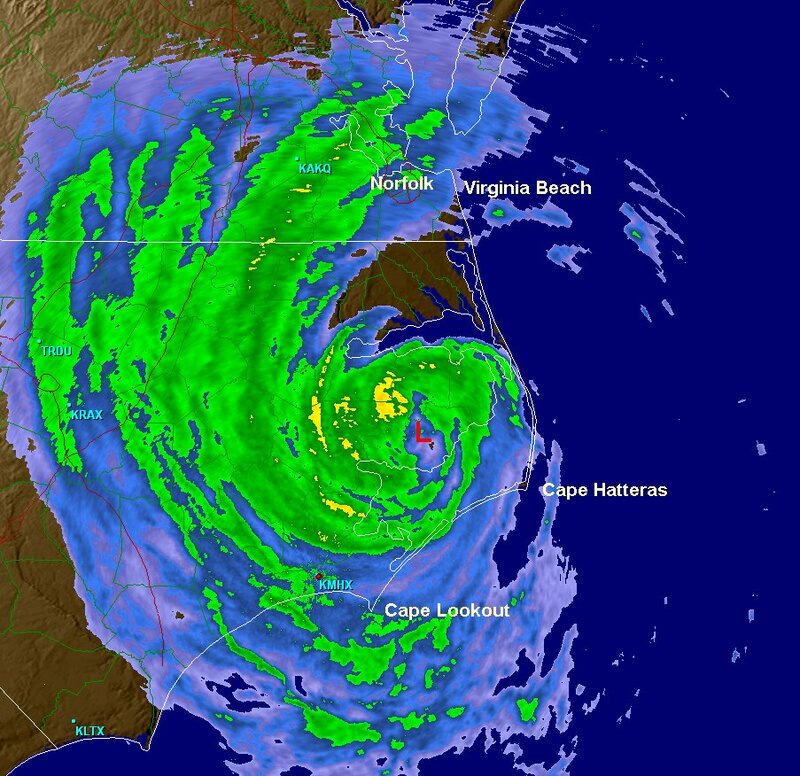 As of 2 pm edt / ast Irene was centered near 35.5 N / 76.3 W or 10 miles north of swanquarter, NC / 95 miles south of Norfolk, VA. It is moving nne at 13 mph. Top sustained winds are estimated at 75 mph / gusts to 85 mph (NHC 85 mph last advisory). Pressure is estimated at 950 mb. Irene is expected to bring strong winds to the Tri-State area Saturday night into Sunday. The low will approach from the south along the New Jersey shore and be near New York City by around 9 or 10 am Sunday morning. Winds will be from the east / southeast and be the strongest just before or around daybreak as the low nears. Winds will drop considerably as the low passes over. Winds will pick up again from the northwest and west as the low moves up the Hudson Valley. Gusts again could be near hurricane force. Keep in mind of the Bernoulli effect! This effect simply is where winds acclerate due to buildings (in this case) blocking the free flow of air. For example, if the wind was blowing 50 mph over an open field that same wind may be 65 mph if forced between skyscrapers. Also, the wind will be stronger higher up. Winds of 50 mph at ground level may be 75 mph or stronger at the top floors of skyscrapers. There is a threat for power outages, trees down and broken windows in these type of winds. Residents are urged to use extreme caution tonight and tomorrow. 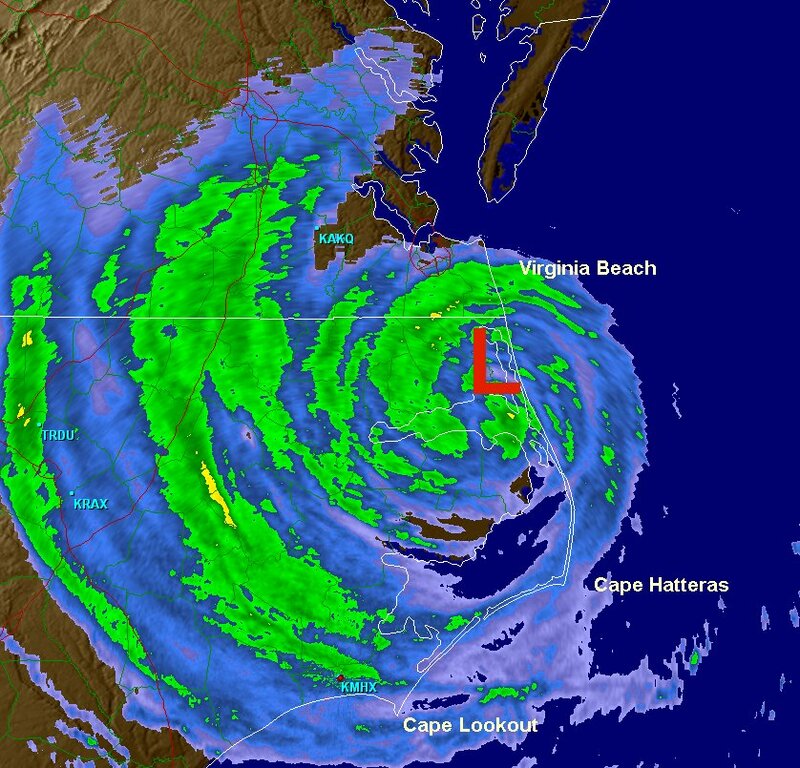 Irene is now moving offshore on the North Carolina / Virginia Beach border. Doppler radar shows a large area of rainfall of 5" or more from Delaware, eastern Maryland, the Tidewater of Maryland to eastern North Carolina. Rainfall totals of more than 10" have been estimated in the area. 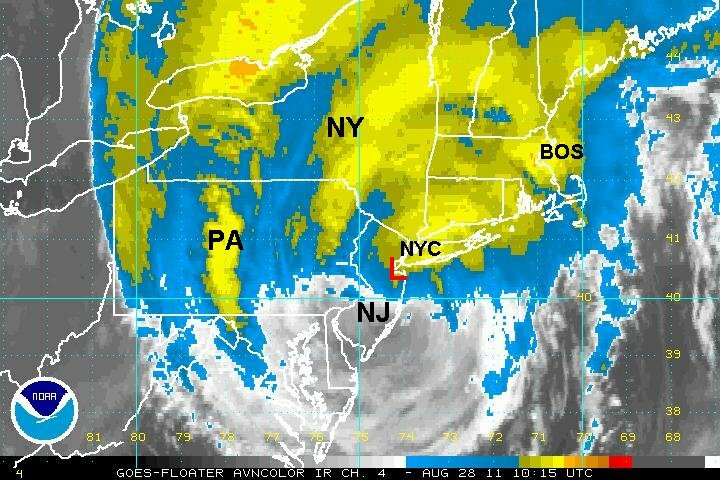 As of 7 pm edt / ast Irene was centered near 36.5 N / 75.8 W or 35 miles se of Norfolk / 315 ssw of New York City. It is moving nne at 20 mph. Top sustained winds are estimated at 70 mph (NHC 80 mph last advisory). Pressure is estimated at 950 mb. 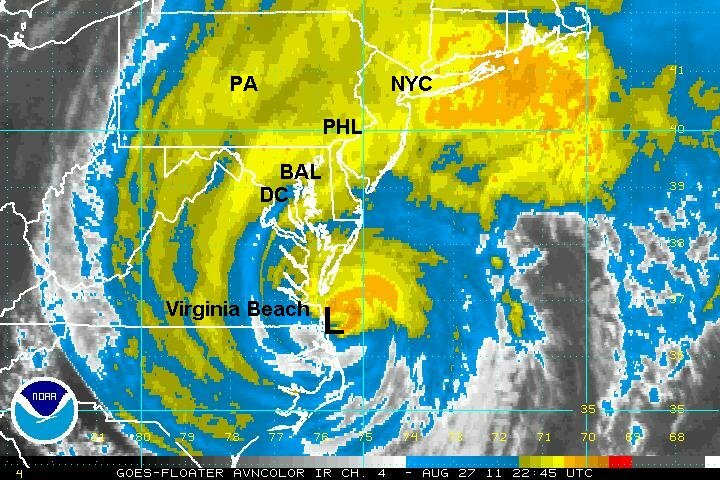 Forecasts take Irene up the Maryland, Delaware and New Jersey coast tonight. Sunday morning Irene will be over New York City around 9 or 10 am. It will then move up the Hudson Valley Sunday afternoon and into eastern Canada Monday. 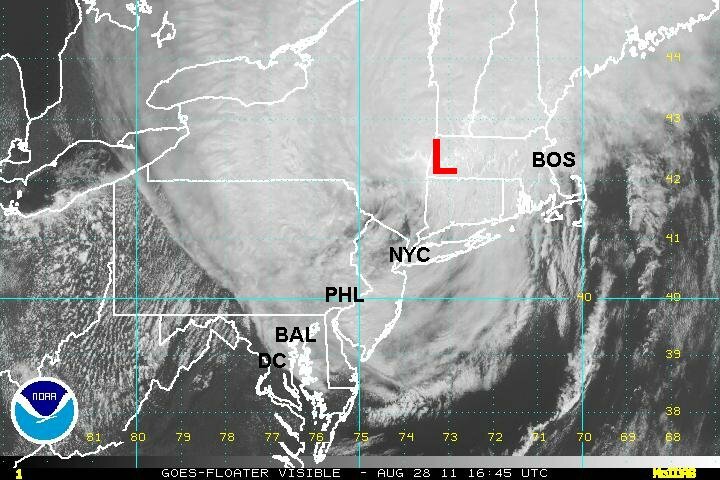 Irene will pass just west of New York City around 9 am this morning. Winds are gusting 55-65 mph in the New York City area and will be dropping off shortly as the low passes by. Winds will pick up from the west or southwest later this morning into this afternoon and become gusty again. Boston is escaping the worst effects of Irene as the track is farther west. Thanks to Nick Stefano for the NJ obs! Doppler radar has estimated over 3 inches of rain in western Connecticut, The Tri-State area and most of NJ. 3-6" has been estimated just east of Baltimore and Washington, D.C. to the Mid-Atlantic coast. 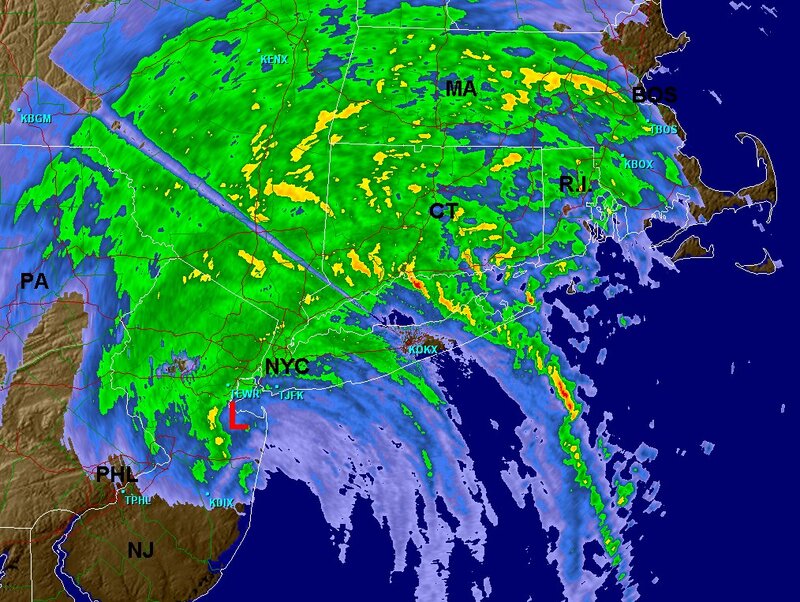 As of 7 am edt / ast Irene was centered near 40.4 N / 74.4 W or 45 miles sw of New York City. It is moving nne at 23 mph. Top sustained winds are estimated at 65 mph (NHC 75 mph last advisory). Pressure is estimated at 958 mb. Forecasts take Irene up the Hudson Valley this afternoon and into eastern Canada Monday. Rainfall of 4-6" was measured near the Tri-State area as Irene moved by. 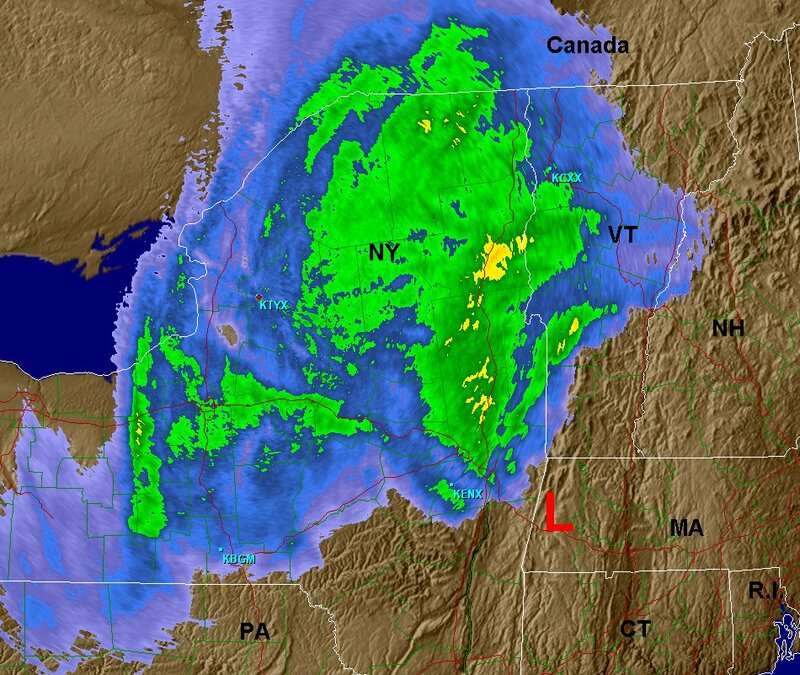 Irene is rapidly taking its precipitation field with it into eastern Canada. Look for improving weather to move into New England tonight. This will be the last update on Irene. As of 2 pm edt Irene was centered near 42.2 N / 73.2 W or 15 miles south of Pittsfiled, MA. It is moving nne at 26 mph. Top sustained winds are estimated at 50 mph (NHC 60 mph last advisory). Pressure is estimated at 970 mb.